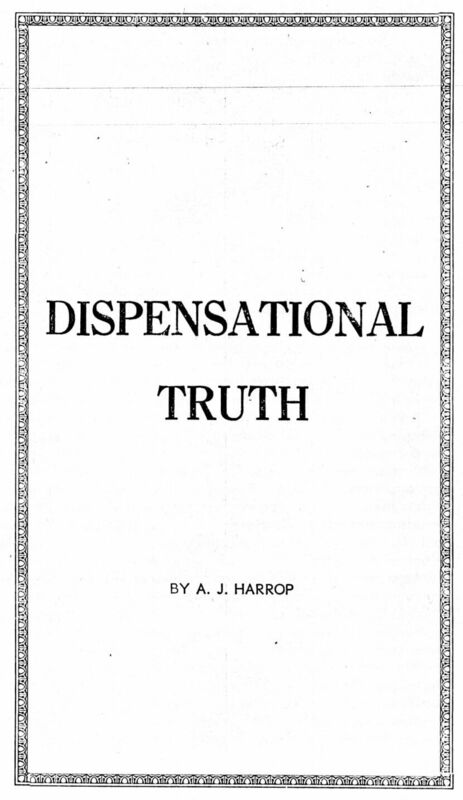 This article was originally published as a pamphlet by A J Harrop titled Dispensational Truth (now out-of-print). Subheadings having been inserted into the edition published below. ‘Dispensational Truth! What on earth is that? 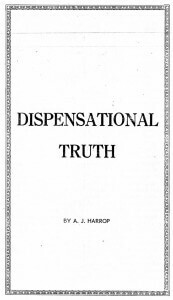 Never heard of such a thing!’ That is the impression some people convey to you when you mention Dispensational Truth or Rightly Dividing the Word. Curiously enough, most of them are already carrying it out up to a point and do not know it. Supposing you ask them, ‘Are you proposing to take a young bullock for sacrifice this time? Or a pair of turtle doves? Or a heifer or a lamb?’ They would either think you were ‘pulling their leg’ or had said goodbye to your wits. If they took you at all seriously they would reply: ‘But we do not have to do those things nowadays; we live in New Testament times. The one Sacrifice has been offered – our Lord Jesus Christ – and those old sacrifices were all fulfilled in Him.’ Good. So you have begun to rightly divide – or, at any rate, to divide the Word of Truth. You have begun to recognise that there are different dispensations, that is to say, differing periods of time in the Word of God in which differing regulations are in force. Well, now, if we are to be obedient to the Word of God, it is essential for us to discover when the dispensation (or administration) in which we live commenced, and what are the regulations concerning it. Another thing which it is desirable to discover, is what our hopes are with regard to it? So, then, supposing we date the commencement of this dispensation at the commencement of our Lord’s earthly ministry, what do we find? Consider Matthew 5, for instance, just a verse or two here and there. Verse 5: ‘Blessed are the meek, for they shall inherit the earth’. I wonder how many Christian people are expecting through meekness to ‘inherit the earth’. We are told elsewhere to set our affection ‘on things above, not on things on the earth’, Colossians 3:2. Then verse 19: our Lord has been speaking of keeping the law (verse 17), and He goes on, ‘Whosoever, therefore, shall break one of these least commandments, and shall teach men so, he shall be called the least in the kingdom of heaven’. It seems to me some will be very low down in the kingdom, having taught for years that there is no need to keep the Sabbath (Saturday), but to keep more or less – mostly less – Sunday instead. If we, personally, do not work on Sunday, we nevertheless allow our ‘menservants and our maidservants’, or, at any rate, our wives to do a bit, also the electric light and gas companies and transport services. It suits us that way. Then go on to verse 42: ‘Give to him that asketh thee, and from him that would borrow of thee turn not thou away’. Well, if it was generally known that Christian people were carrying that out, we should soon have nothing left but loin cloths – someone might even borrow that! No, we do not carry that out – it would not suit us that way. Maybe after all, those things are instructions which do not belong to us. Suppose, then, we commence our dispensation at the crucifixion. What instructions are given after that? Now, after the crucifixion and resurrection, there are not very many. The last two verses of Matthew’s Gospel say, ‘Go ye, therefore, and teach all nations, baptising them in the name of the Father, and of the Son, and of the Holy Ghost; teaching them to observe all things whatsoever I have commanded you’. Most Christian organisations make some pretence of carrying that out up to a point, but what are the ‘all things whatsoever I have commanded you?’ They must include the ‘giving to him that asketh thee’, and the other things to which we have referred earlier. Turn now to Mark’s Gospel. At the end of Mark we have several verses – sometimes they are left in, sometimes they are left out. The trouble is that Christian organisations do not know what to do with them. After giving similar instructions to Matthew 28:20, Mark 16:17 and 18 go on to say: ‘And these signs shall follow them that believe: in My name shall they cast out devils; they shall speak with new tongues; they shall take up serpents; and if they drink any deadly thing it shall not hurt them; they shall lay hands on the sick and they shall recover’. You see what the difficulty is? These signs do not now follow them that believe. I would challenge any Christian to ‘drink any deadly thing’ and prove it. So, perhaps, we were wrong in fixing the commencement of our dispensation at the crucifixion. Obviously, the Church of this dispensation had not started then. Marvellous as it may seem, God was giving Israel another chance! Did you ever read the parable of the fig tree – the one in Luke 13:6–10? During three years the fig tree bore no fruit – ‘Cut it down’. Verses 8 and 9: ‘And he answering said unto him, Lord, let it alone this year also, till I shall dig about it and dung it, and, if it bear fruit, well; and if not – after that thou shalt cut it down.’ Well, what do you make of it? During the three years of our Lord’s ministry the fig tree (Israel) bore no fruit – ‘Cut it down’. Our Lord’s plea was ‘Give it one more chance’. At Pentecost, Acts 2, the ‘one more chance’ came: Peter and the Apostles were digging and manuring. The cutting down was postponed, but in the end it had to come, and that was at Acts 28 – read the last few verses of that chapter. Before we get there, however, we must consider further the story of the Acts of the Apostles. They come again in the Revelation. They refer to the tremendous happenings which are to take place at the Second Coming of our Lord – when He shall come in ‘power and great glory’ to set up His kingdom upon earth with Jerusalem as its centre. Peter was expecting this. It was Israel’s chance. ‘Repent ye, therefore, and be converted… and He shall send [again] Jesus Christ which before was preached unto you’, Acts 3:19–20. Those were the days when they could ‘give to him that asketh thee, and from him that would borrow of thee turn not thou away’, Matthew 5:42. Such things will be possible again at the ‘coming of the Lord’ during the millennial kingdom. All those momentous happenings were just preliminary foreshadowings of that great day. So you see the Church of this dispensation did not begin at Pentecost. We must move still further on. The next possibility is Cornelius. By the way, the Grecians mentioned in Acts 6 were ‘Hellenists’ or Greek-speaking Jews, not Gentiles. But Cornelius and his friends were Gentiles. If Cornelius himself could be considered a proselyte on account of his devotion, Acts 10:2, yet his ‘kinsmen and near friends’, verse 24, were certainly Gentiles. Peter was staggered. If he had not had the vision recorded in verses 11–17, he would never have come. It just shows how the Children of Israel had grown to consider God as their national monopoly. Instead of which, God’s design was to use the Jew to proclaim His grace and salvation throughout the world. Peter, to whom was given the ‘keys of the kingdom’, Matthew 16:19, was driven at last to open the door. Was this, then, the beginning of the Church of this dispensation? No! No! These Gentiles were entering in to partake of Israel’s blessing. As Paul wrote later, they were partaking ‘of the root and fatness of the olive tree’, Romans 11:17. The Jews were still God’s people at that time. The olive tree represented Israel. So, then, we must draw on a bit further if we are to discover the commencement of our dispensation. After the story of Cornelius we find that Peter drops right out of the picture. Paul has begun his work. At Antioch to start with, Acts 11:26, not Jerusalem now. The centre has moved out. Then come the missionary journeys. We notice that wherever he goes, Paul always goes first to the synagogue. It is still the Jew first, and through the Jew to the Gentile. There is, however, a difference. These Gentiles were uncircumcised and Paul did not insist that they should be circumcised, or carry out any of the other rites and ceremonies concerned with the Law of Moses. To clarify this matter, Paul goes up to Jerusalem to tell his doctrine to James and the other Apostles – see Acts 15. The result of this visit is that a double code of instructions is issued. For the Gentile: ‘that they abstain from pollutions of idols, and from fornication, and from things strangled and from blood,’ and that is all, verse 20. For the Jews there was the synagogue: ‘for Moses of old time hath in every city them that preach him, being read in the synagogues every sabbath day’, verse 21. Is this, then, the Church of our dispensation coming in? No, not yet. There is no dual code nowadays, neither do we obey some of those Gentile regulations, short as they are. You see, the effect of that great influx of Gentile believers might either have meant that the national repentance of the Jew was hastened, or that they hardened their hearts. They could have been ‘moved to emulation’ – or spurned Christianity with hatred. That was their last opportunity. They made a fatal choice – they hardened their hearts. It is interesting to notice that at Corinth, Paul leaves the synagogue and enters into the house of one named Justus, ‘whose house joined hard to the synagogue’, Acts 18:7. It is as though – in spite of the separation which seemed inevitable – God (through Paul) was still holding on to the Jew. Anyway, there is no complete separation yet. The next chapter brings us to Ephesus. Here we read (Conybeare): ‘For three months Paul continued to speak boldly in the synagogue… and in the end the Apostle’s doctrine was publicly calumniated by the Jews… on this he openly separated himself… and the Christian Church at Ephesus became a distinct body,’ the headquarters being the school of Tyrannus. So the separation grows wider. Now, in chapter 20, a great break takes place. Paul (an orthodox Jew still) must be at Jerusalem for the Feast of Pentecost, verse 16. It is a strikingly sad and sorrowful passage, verses16–38. It says in verses 22 and 23: ‘And now, behold, I go bound in the Spirit unto Jerusalem not knowing the things that shall befall me there, save that the Holy Ghost witnesseth in every city, saying that bonds and afflictions abide me.’ Verse 25: ‘And now, behold, I know that ye all, among whom I have gone preaching the kingdom of God, shall see my face no more.’ Verse 38: ‘Sorrowing most of all… that they should see his face no more.’ Again at Caesarea, in chapter 21 verse 13, there is the same sad parting note: ‘Paul answered, “What mean ye to weep and to break mine heart? For I am ready, not to be bound only, but also to die at Jerusalem for the name of the Lord Jesus”.’ At Jerusalem we know that the whole venom and hatred of orthodox Judaism was vented against Paul, and the outcome is Paul’s appeal to Rome. Well, that is the end. So far as the Jew is concerned, the olive tree is cut down. For close on 2000 years God has had no dealings with the Jews as a nation. They have been scattered all over the world, as He said they would be in Deuteronomy 32:26. So what next? I suppose most of us know what comes next. It is the wide-open door, the beginning of a new dispensation. To Paul has been entrusted a further message, of which he tells us in the Epistles to the Ephesians, Philippians and Colossians. In Ephesians 2:11–13 it says: ‘Wherefore, remember that ye being in time past Gentiles in the flesh… that at that time ye were without Christ, being aliens from the commonwealth of Israel and strangers from the covenants of promise, having no hope, and without God in the world: but now in Christ Jesus ye who sometimes were far off are made nigh by the blood of Christ.’ So, no longer has the Jew the favoured place. No longer is the Gentile dependent upon the Children of Israel for his knowledge of God. He, as a Gentile, is ‘made nigh by the blood of Christ’. Now the door is wide open, the new dispensation has commenced. What regulations have we, then, for the new era? Well, we shall not expect to find them in the Old Testament, nor yet in the Acts of the Apostles, nor in the Epistles to the Corinthians. But if we ‘walk worthily’ in accordance with Ephesians, chapters 4, 5 and 6; ‘press towards the mark’ in accordance with Philippians 3:14; ‘seek those things which are above’ in accordance with Colossians 3:1; and ‘hold fast the form of sound words’ in accordance with 2 Timothy 1:13, we shall have as much as we can manage without trying to tune our lives to accord with the regulations of dispensations which do not apply to us. Instead of being grafted on to the olive tree, we are now the Church of the One Body in Christ, Colossians 1:18. Also, we have special promises to look forward to, which were not revealed before. The Old Testament reveals a promise made to Israel as a kingdom upon earth, its centre to be Jerusalem and its King the coming Messiah. That promise will be fulfilled. Its inhabitants will be the Children of Israel in resurrection, and those upon earth who will repent as one man and receive our Lord at His second coming, these will cry out in that day: ‘Lo, this is our God, we have waited for Him and He will save us’, Isaiah 25:9. Then a further promise was given to Abraham and to his seed – the promise of a heavenly city. ‘For he looked for a city which hath foundations, whose builder and maker is God’, Hebrews 11:10. ‘But now they desire a better country, that is an heavenly; wherefore, God is not ashamed to be called their God, for He hath prepared for them a city’, Hebrews 11:16. Hebrews speaks of ‘a better hope’; ‘a better resurrection’; ‘a better covenant’; ‘better promises’; and so on. There is, however, reserved for the Church of the One Body, an even more glorious hope. Humanly speaking it is still a ‘hope’. In God’s sight, however, it is an established fact, for it says in Ephesians 2:4–6: ‘But God… hath raised us up together, and made us sit together in heavenly places in Christ Jesus’. Those ‘heavenly places’ are ‘far above all principality, and power, and might, and dominion, and every name that is named, not only in this world, but also in that which is to come’, Ephesians 1:21.